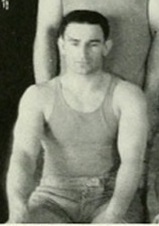 Elky Maister was a short stocky guard at Syracuse. Maister teamed with Ronnie Phillips to form a dynamic backcourt for three seasons; at the time of their graduation, they were considered one of the most formidable backcourts the Orange had ever had. For his era, Maister had a high shooting percentage and was recognized as being a solid shooter. Against Cornell on February 4, 1933, Maister has a career high 15 points. He was named the MVP of the basketball team for his junior season. Maister also lettered in baseball in 1932. Elmer was the younger brother of Mike Maister, who played basketball and football for Syracuse in the mid 1920's. He played professional basketball for Syracuse in the NYSL in 1934-1935, and for Buffalo in the MBC in 1935-1936.